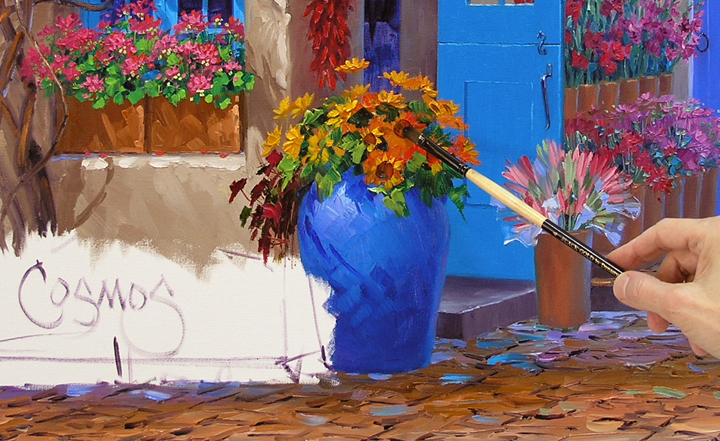 Bright yellow Sunflowers just seem so right in a blue pot. 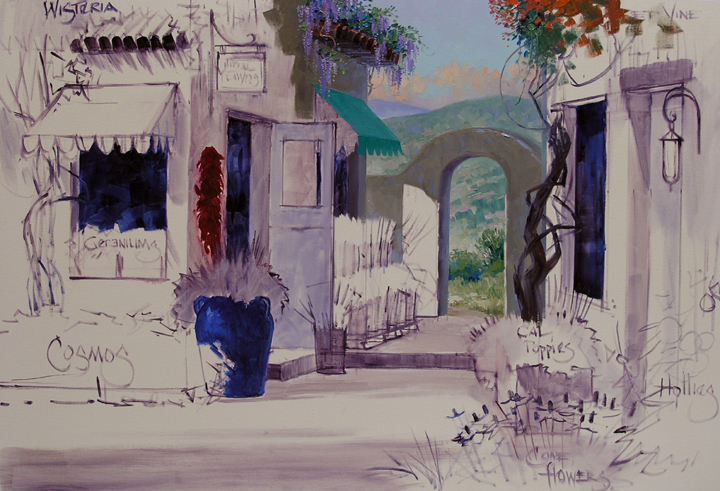 The blossoms are blocked in first followed by the warm green foliage, made of Ultramarine Blue + Hansa Lemon Yellow. The Sweet Potato Vine is Alizarin Crimson + some of the warm greens from the Sunflowers. The centers are added and Presto………Sunflowers! This is when saving all the extra paint mixed from our basic primary colors comes in handy. If you would like to find out more about our Double Primary Palette just click here. I’ve taken several of the leftover greens, mixed them together and added Pthalo Blue, making a cool, gray-green. The mixture will be used for the foliage of the Salvia and Poppies in the container by the foreground door. The purples from the Wisteria transform into the Salvia blossoms. 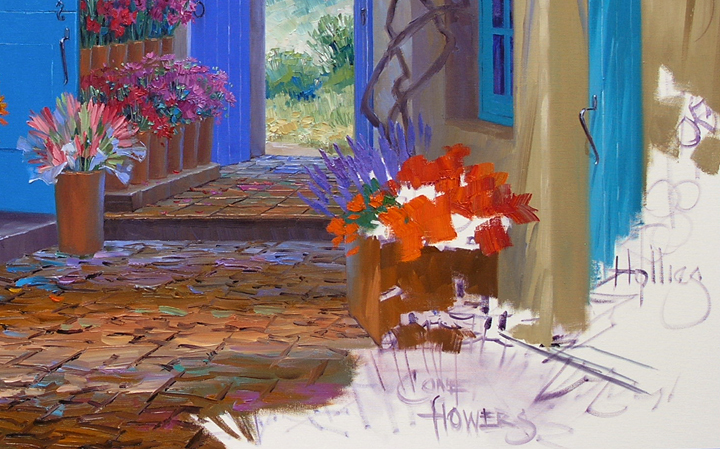 Alizarin Crimson is mixed into the Sunflower color to make the oranges for the California Poppies. My Hollyhock reference is on the computer so out comes the laptop. The blossoms are mixed from one of those “Special” colors we use occasionally, Permanent Rose. 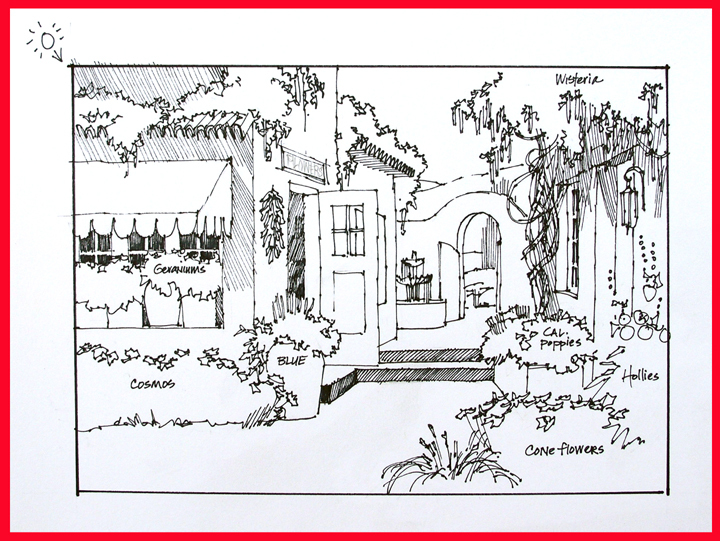 Cadmium Red Light + White is added in various proportions to make a range of coral colors. 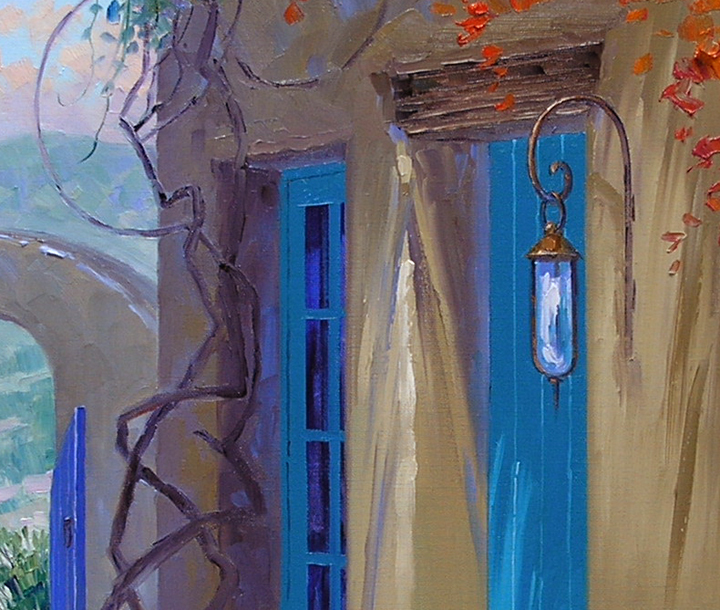 Paintings are made up of lots of little details. 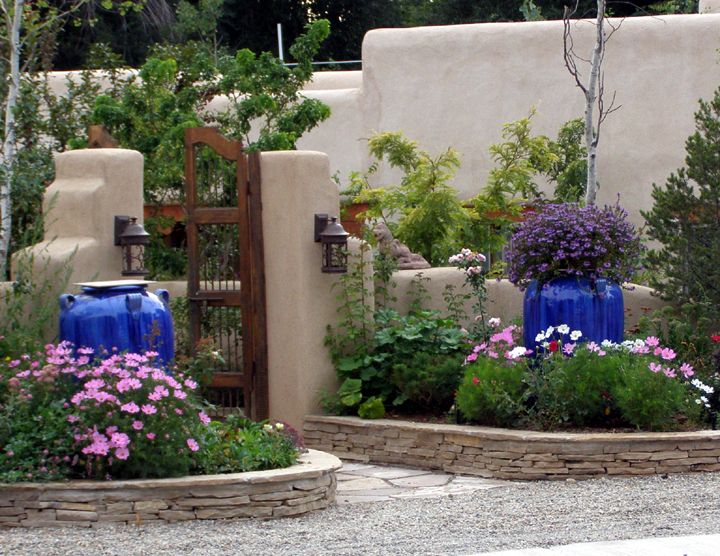 We photographed this lantern in Santa Fe, a quaint accoutrement. First a mix of White + Ultramarine Blue is dragged over the wet paint of the door to indicate the glass. 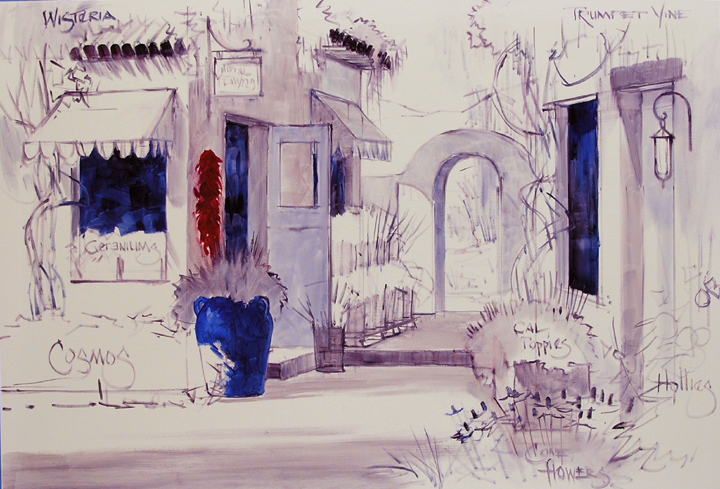 Next the outer, wrought iron frame of the lantern is drawn with MUD (Ultramarine Blue + Alizarin Crimson) + Liquin. The upright on the back, seen through the glass, is made lighter. Painting the top of the lantern, highlighting the glass and bracket adds the finishing details to this unique light fixture. 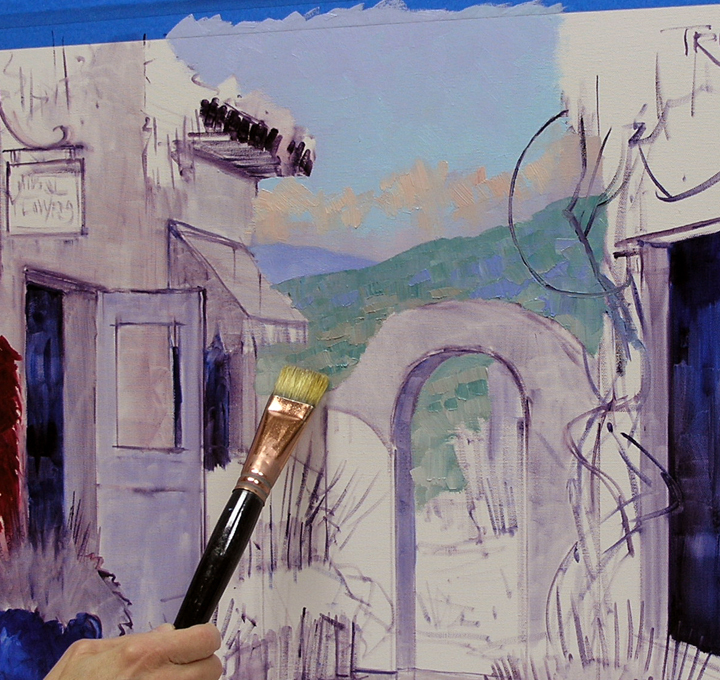 While the paint of the adobe building is wet it’s time to complete the trumpet vine cascading down the wall. 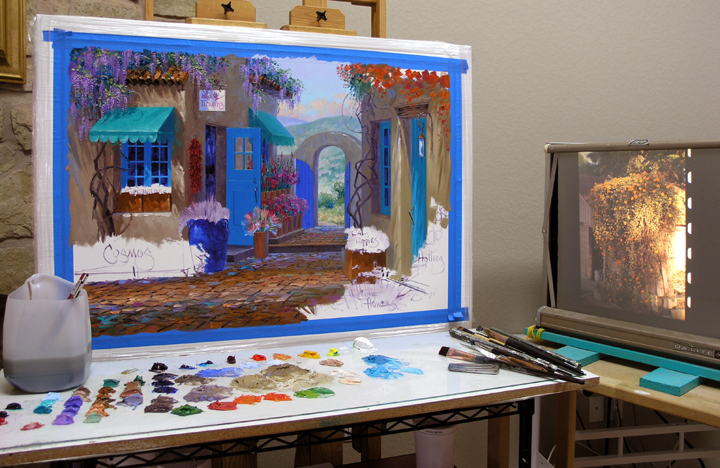 My reference slide is projected into the rear screen beside my easel, making it easy to follow. The floor of the alley is painted first making the distant tiles cooler (bluer) so they go back. 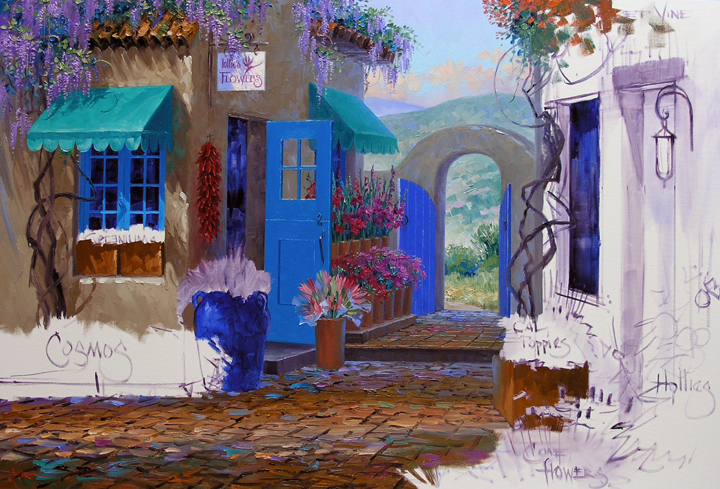 Using colors saved from the roof tiles and terra-cotta pots the light and dark pattern on the cobblestones is blocked in. 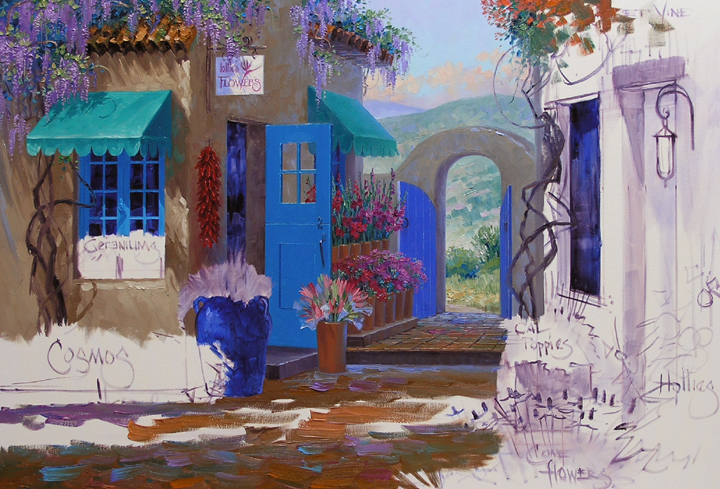 With a thin mixture of MUD (Ultramarine Blue + Alizarin Crimson) + Liquin the crevices between the stones are indicated. 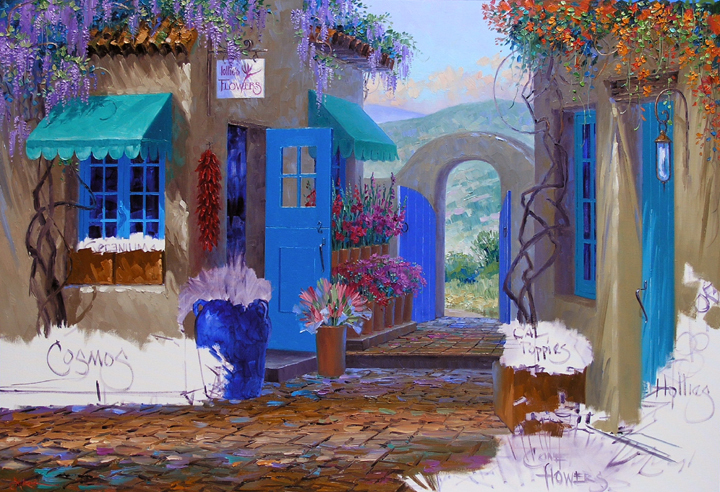 Strokes of color from the awning, door and Wisteria are added to the cobbles to give the impression of reflections on the wet stones. The cobblestones are now complete. Notice the “Threshold” shadow across the foreground. 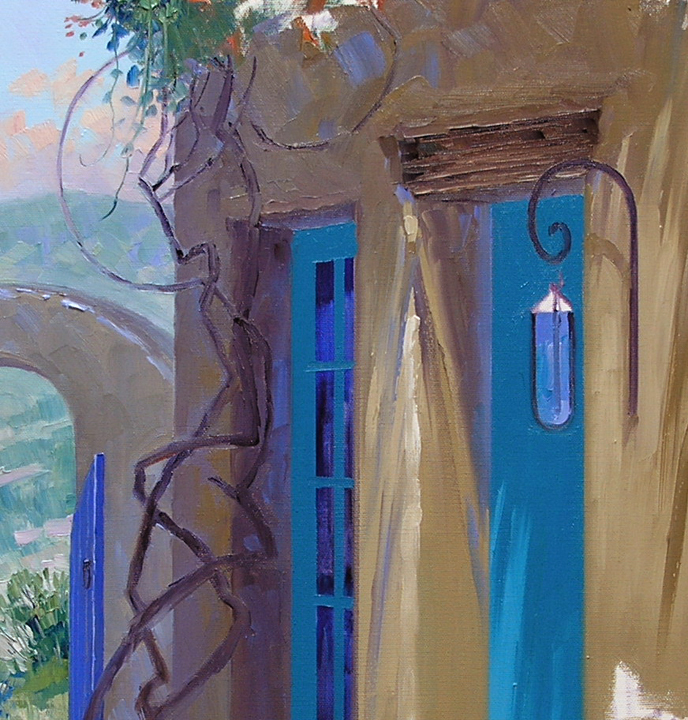 When the painting is finished you will see how your eye is drawn over the dark shadow to the sunlit areas of the piece. 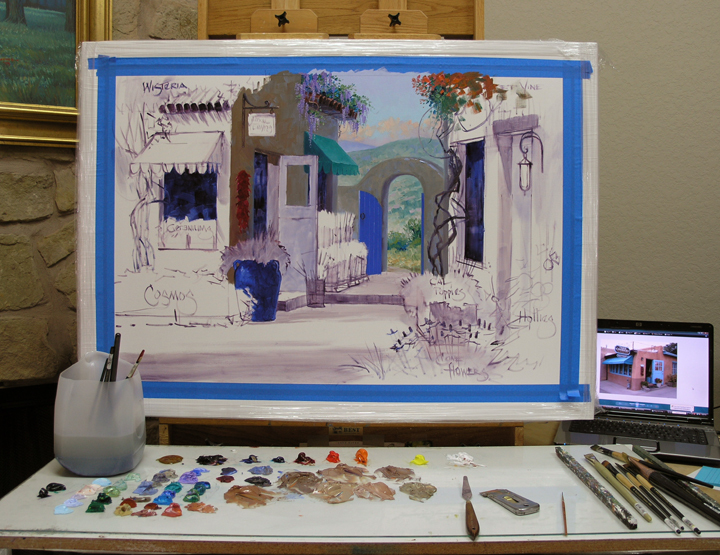 Moving to the adobe building in the foreground I use Cadmium Orange + Pthalo Blue + White for the base mix. MUD is added for the shadows. More White is used for the areas of the wall touched by the sun. 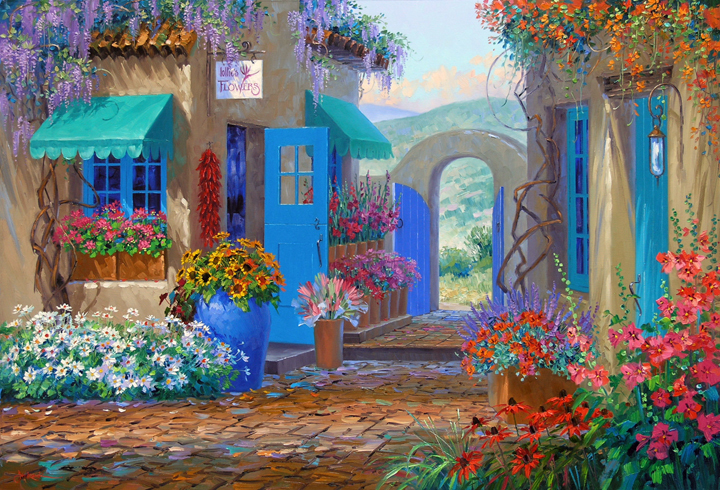 In order to make the open gate be the “Light at the End of the Tunnel” the flowers lining the alley have to be dark. The terra-cotta pots are painted first. This area needs to be muted. I want it to be there, but not drawing attention, so your eye will travel past the fresh blooms to the sunlit landscape. When the containers are complete the flowers are blocked in. The foliage of the Mums and Gladiolas finish out the colorful racks. 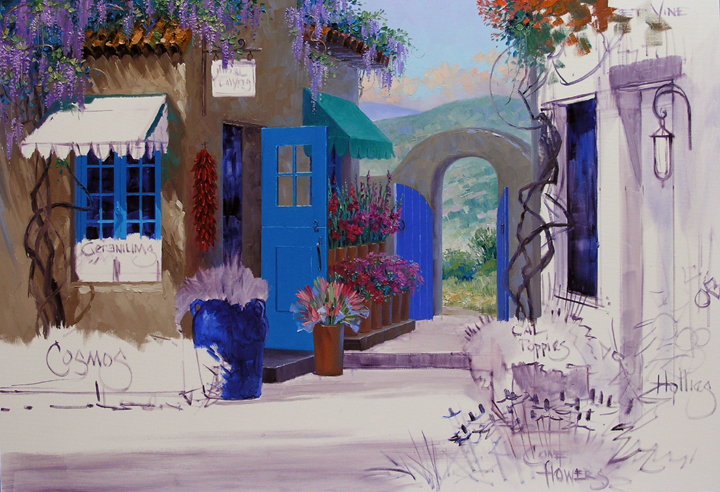 The door is a mixture of Pthalo Blue + White with a little MUD (Ultramarine Blue + Alizarin Crimson) added. To learn more about our Double Primary Palette just click HERE. The terra-cotta pot to the right of the door with the cellophane wrapped Lilies is a treat. Frankly it painted itself, I just grabbed the brush and hung on. The pink flowers are a mix of Alizarin Crimson + White while the greens are left over from the Wisteria. 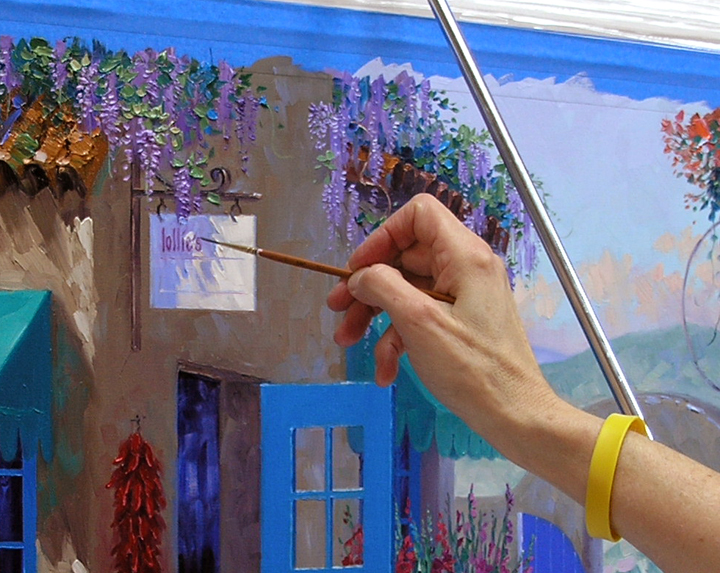 Some of the blues and lavender from the sky are used for the clear cellophane. A special color is brought into play for the awning, Viridian Green. 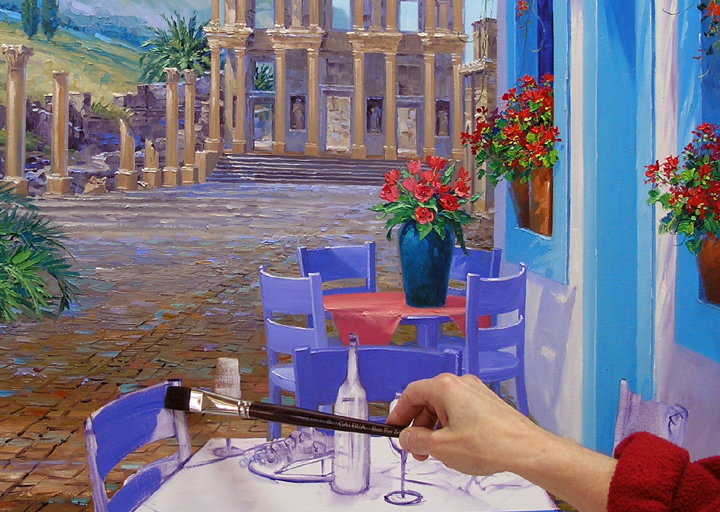 A touch of Pthalo Blue and White is added to the Green, Ultramarine Blue is then thrown in for the darker shadows. The slanted surface of the awning is the lightest because the sunlight hits it directly. The upright of the scalloped edge is a little darker. Even though the upright plane is still in the light it receives less sun than the slanted surface. Now for the sign. The light and shadow on the white board of the sign are blocked in first. I pull out my trusty mahl stick to brace my hand for the lettering. 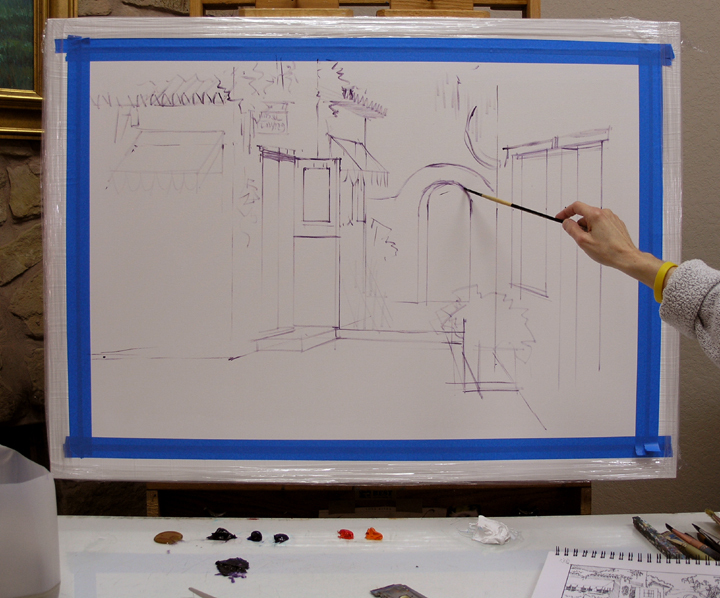 A thin mix of Alizarin Crimson + Liquin is used to draw the individual characters into the wet paint. You can see the horizontal guide lines I drew to help keep the lettering straight. The lines will be taken out when the sign is finished. Out comes the laptop to view my reference for the Flower Shop. Painting the side wall of the building I make it warmer and darker as it comes forward. 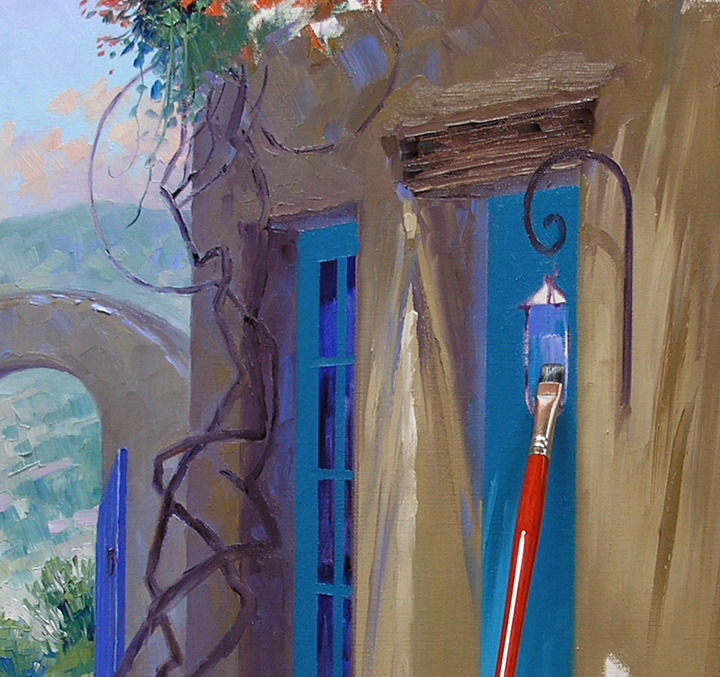 The adobe is my basic mix of Cadmium Orange + Ultramarine Blue + White with a little bit of Alizarin Crimson added. 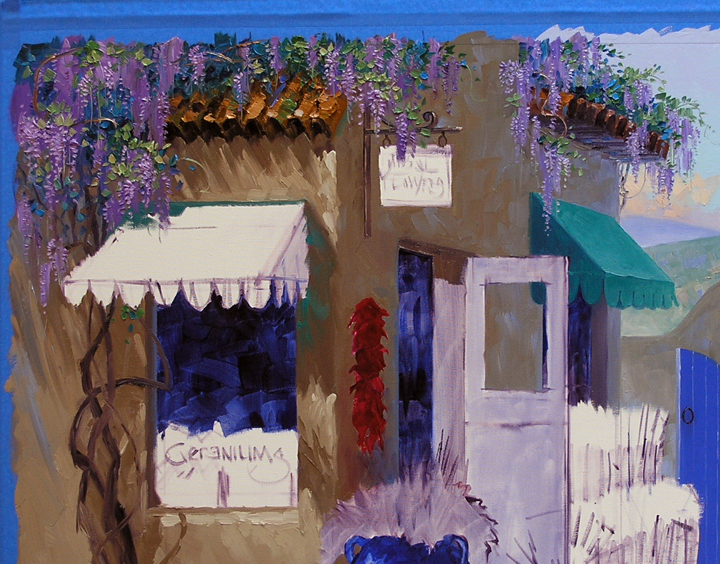 The front wall is fun to paint with all of the shadows cast by the Wisteria, roof tiles and the awning. 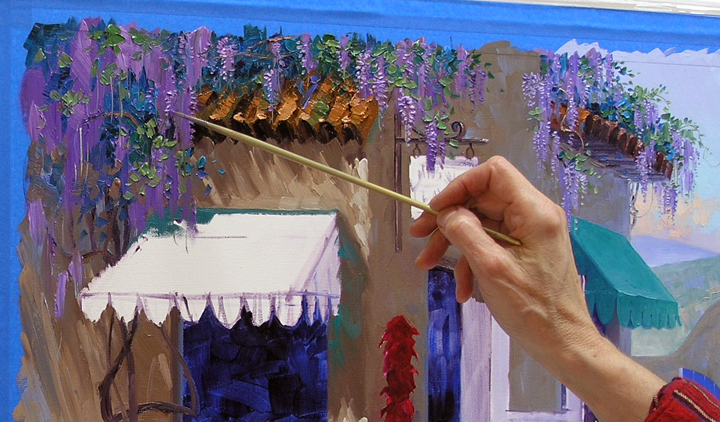 The undulating trunks of the Wisteria are painted wet-into-wet. Under the awning a touch of green is added where it would reflect down on the shadowed area of the wall. 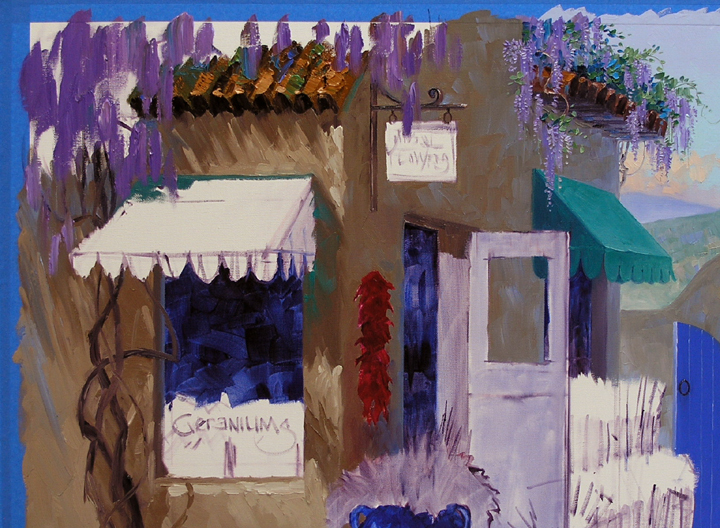 The trick to Wisteria is making it wispy and delicate. The first one I painted definitely was not that. Over the years I’ve gotten better at it. 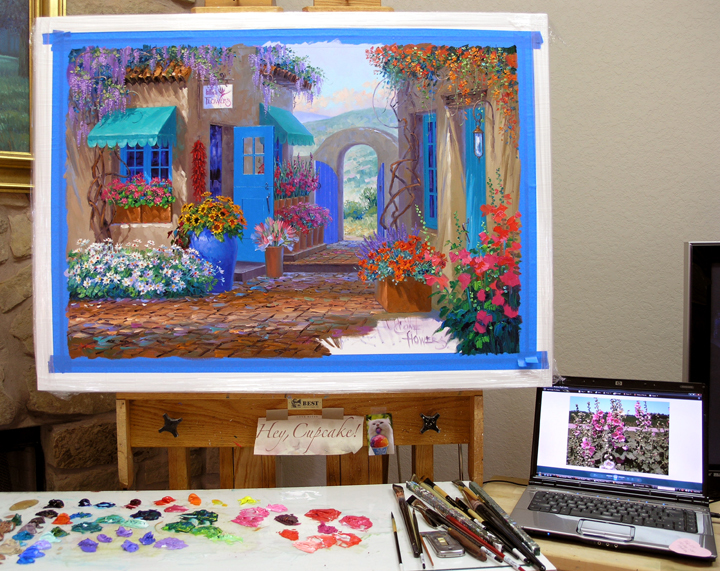 The first step is to block in several shades of purple for the blooms. 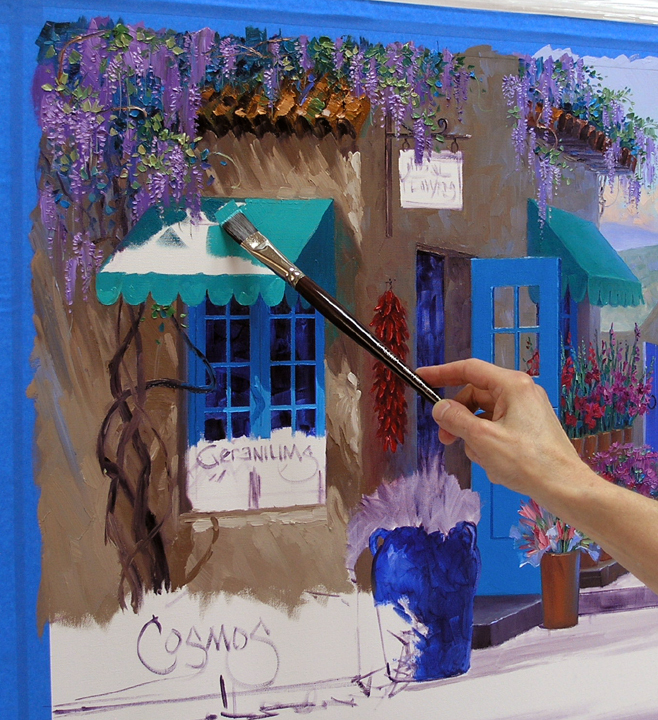 Next the foliage is worked in and around the purple with a large bright brush. Coming back with a small brush the petals of the blooms are added. My paint is mixed for the sky and I’m ready to begin. 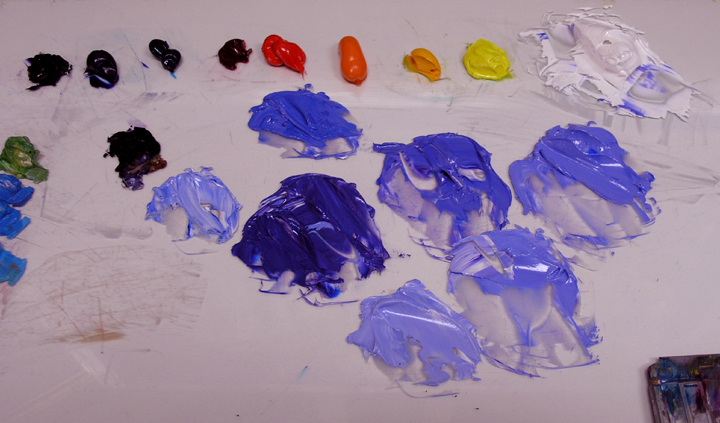 The two lavenders on the left are MUD (Ultramarine Blue + Alizarin Crimson) + White. Moving to the right is Pthalo Blue + White, Ultramarine Blue + White and two shades of Alizarin Crimson + Cadmium Orange + White for the highlights on the clouds. After finishing the sky I step forward to the mountains. The one in the far distance is made with Ultramarine Blue + White so it will recede. The top of the mountain is painted darker, getting lighter as it descends to indicate haze between the two peaks. 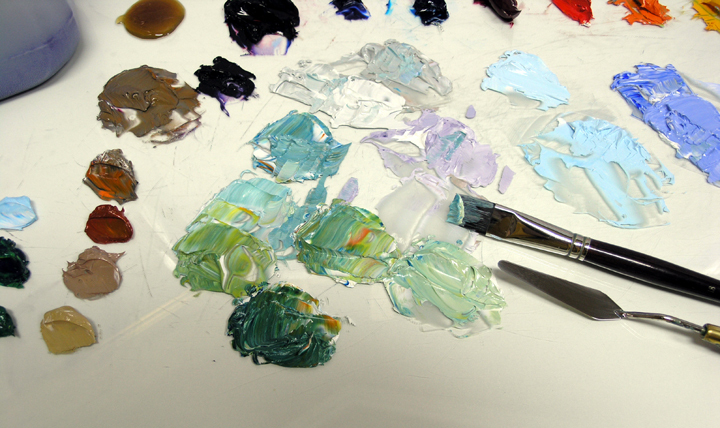 The closest mountain is made warmer using mixes of Pthalo Blue + Cadmium Orange + White. 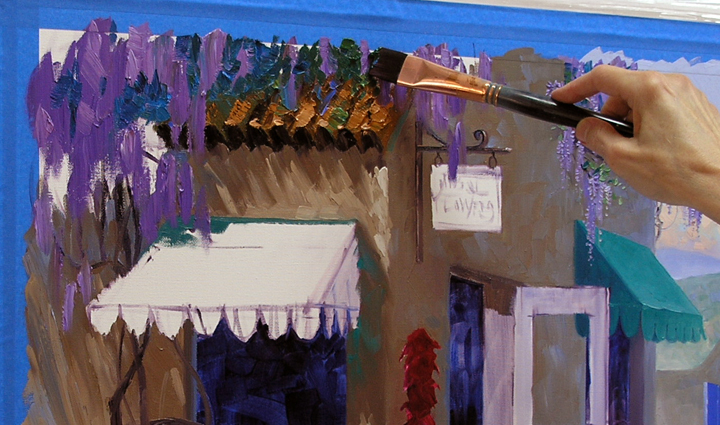 I also make a few brushstrokes with lavenders from the sky and blue from the other mountain. This cools and adds interest to this area. Using the mountain colors for my base Cadmium Yellow is added for warmth and Pthalo Blue for darkness. The resulting mixtures are used for the brushy landscape seen through the open gate. The warmth of the landscape is already adding depth. 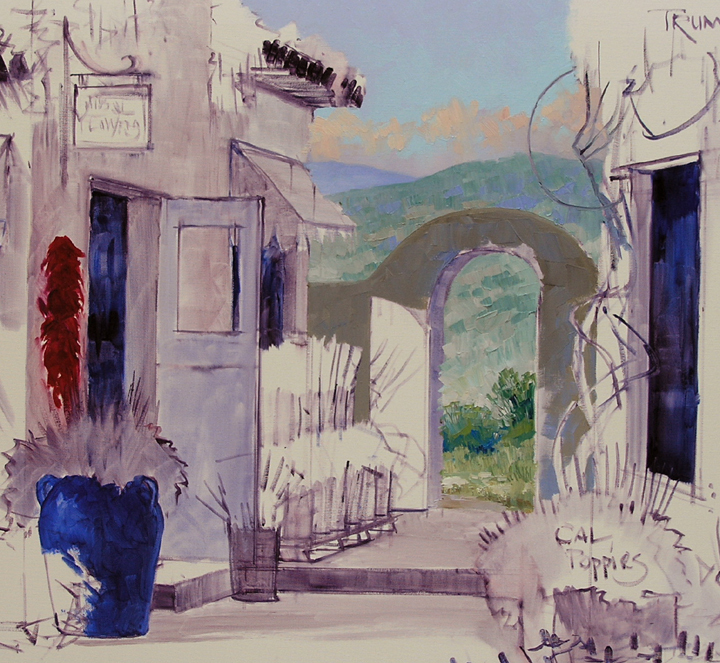 Since there are several adobe buildings in this piece I make the wall with the gate very cool so it will recede. I want it to be dark so your eye is drawn through the opening to the light beyond. BUT the wall can’t be too dark because it has to drop behind the buildings in the foreground. 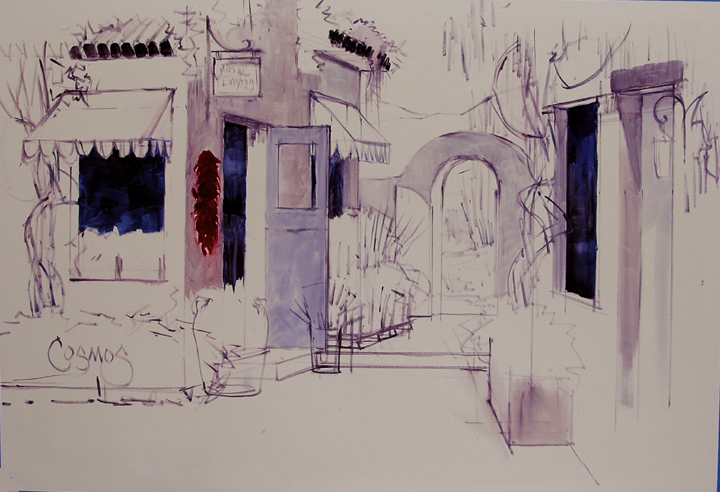 First the uprights of the basic architectural elements are lightly drawn with a brush dipped in a thin mixture of MUD (Ultramarine Blue + Alizarin Crimson) + Liquin. Perspective lines keep me on track as I establish the skeleton of the piece. I love this stage of the painting, it’s fun to build on my original ideas. At first I had planned a fountain in the background by the gate. 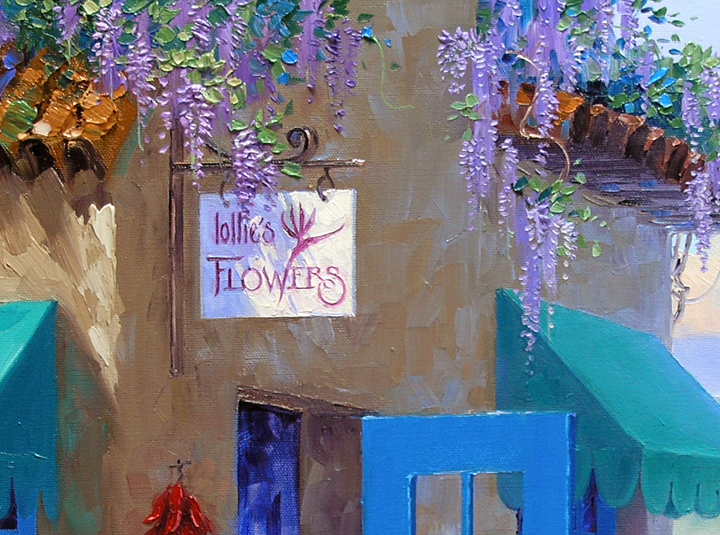 But at 3:14 this morning I woke up with the thought, “it’s a flower shop. 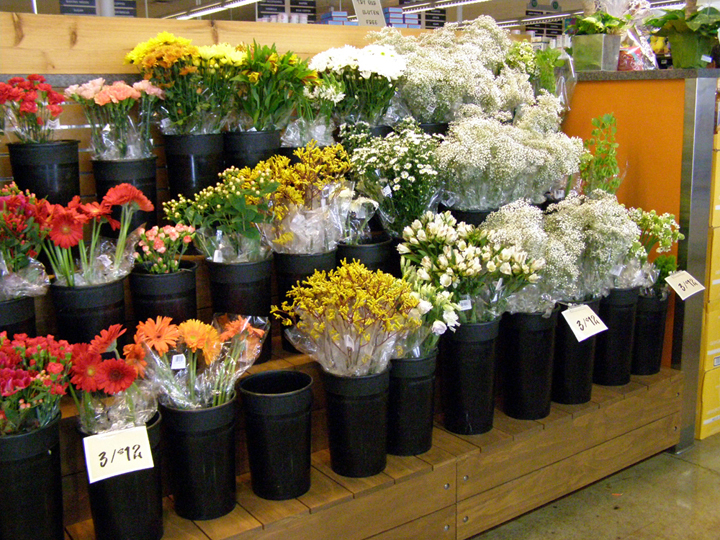 We need racks of cut flowers.” We had taken some pictures at the Central Market in San Antonio that I won’t copy exactly but offer good reference. With flower stands now lining the alley, this is really beginning to look like a flower shop. 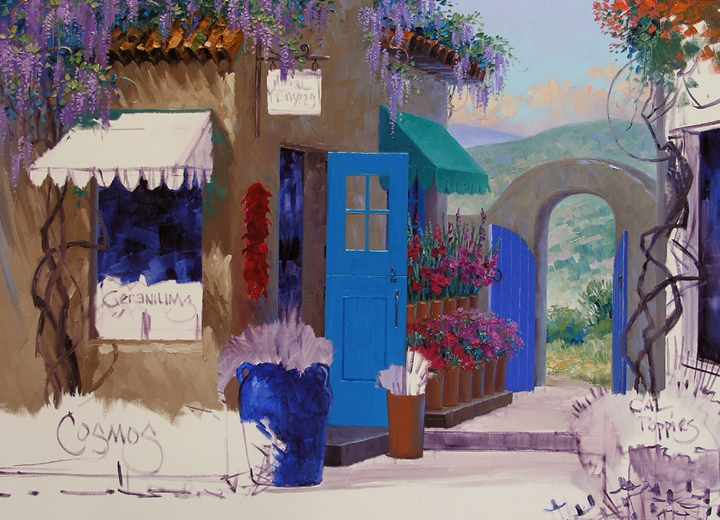 After the buildings are set the pots, flowers, vines and various accoutrements are drawn in. At this point changes are made, like shortening the window with the awning on the front of the Flower Shop, then adding one on the side. Some of the shadow areas are washed in with the same thin, Liquin mixture. 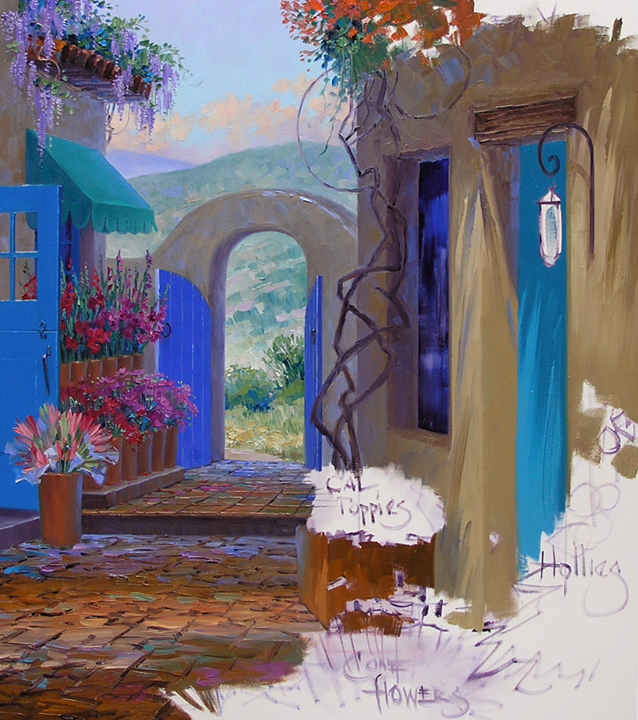 When building a painting I follow the flow of ideas. It seems as if one thought generates another. All of a sudden I start remembering pictures from out of the past, perfect for the piece I’m working on. The two different photos above are used as reference for the large container by the front door of the flower shop. 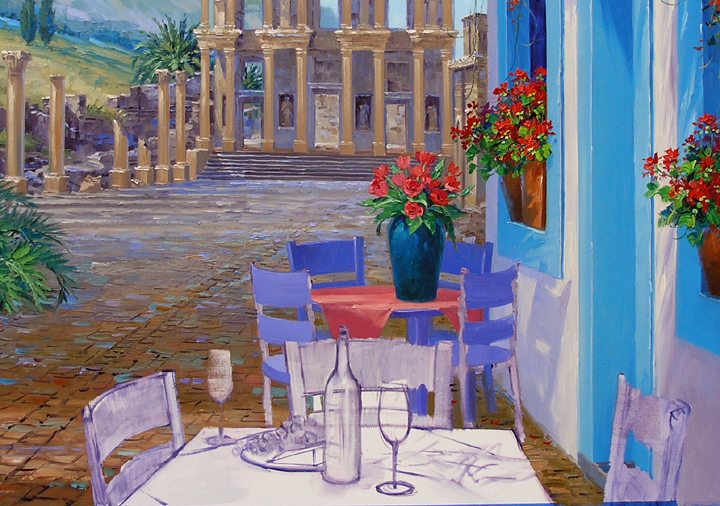 The picture on the left is on the Plaza in Santa Fe. 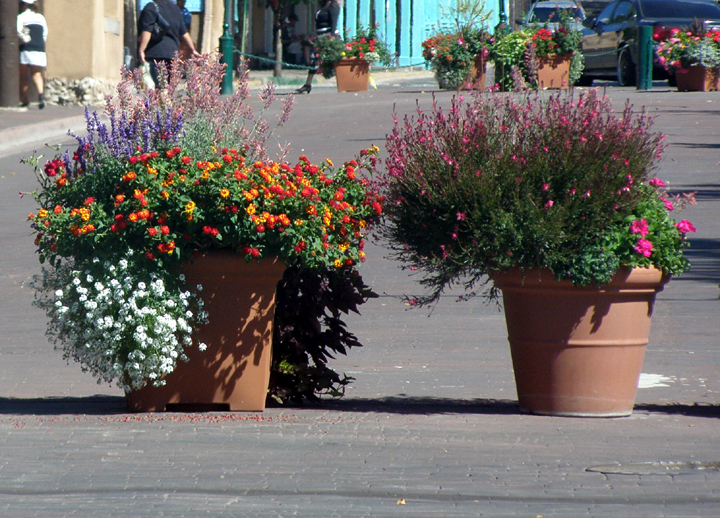 Some of these flowers will be planted in the beautiful blue pot from Taos seen on the right. 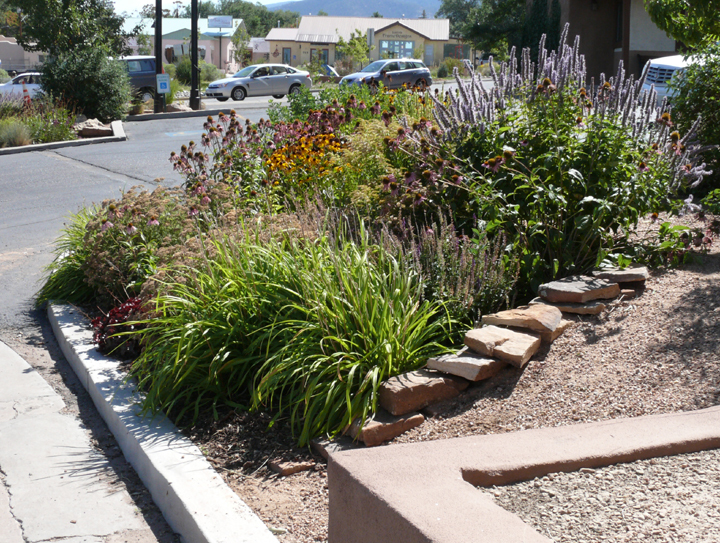 The colorful flower patch above was taken as we drove into town on our last trip to Santa Fe. My heart jumped with excitement when I saw these lush blooms. Jotting down ideas for this piece in my sketchbook I remembered the delightful desert garden. Spring is right around the corner. 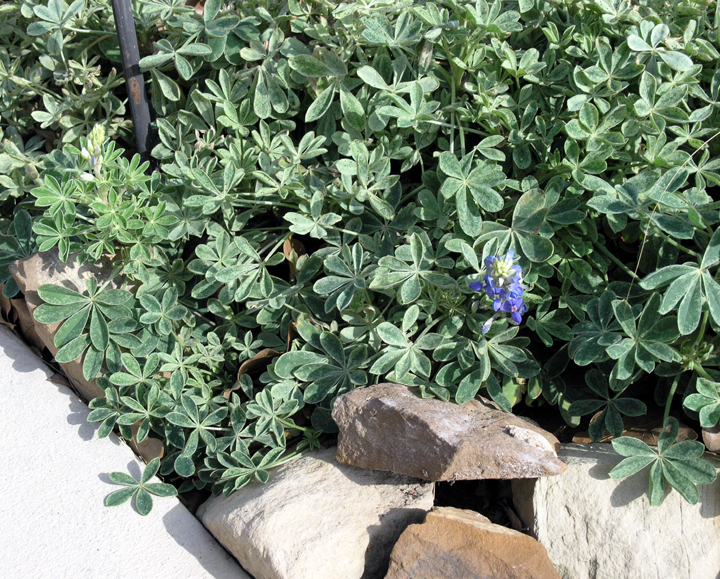 We saw our first bluebonnet today, that means winter is almost over. Our hearts go out to those of you living in the frozen tundra. BRRRR! I honestly don’t know how you survive the cold. Jack and I are certified Wimps and that’s with a capital “W”. Today’s project is for our gallery in Santa Fe. They’ve recently sold a couple of pieces and need replacements. The photo above sparked my imagination. 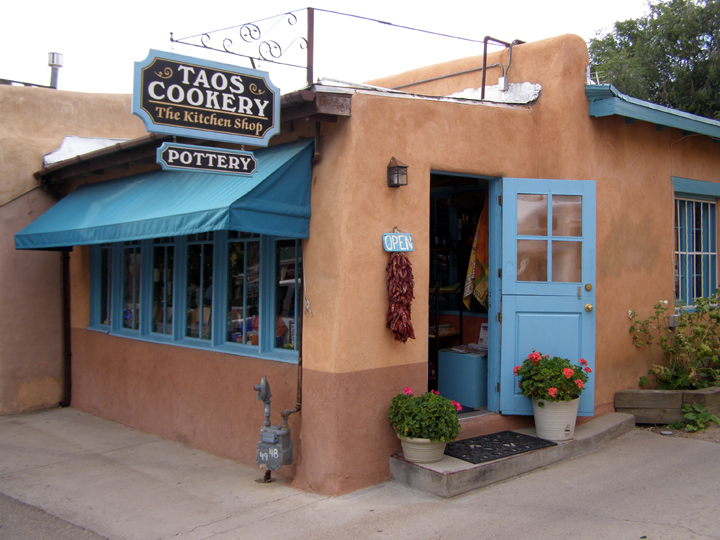 Cooking is not big on my list, but gardening is so we are going to move this cute little setting from Taos to Santa Fe and convert it to a flower shop. Taking the shadow color from the distant tablecloth I block in the one in the foreground. A little of the chair color is added into the mix for the far edge of the cloth, making it drop back. The front of the cloth is painted a bit lighter. This “Lifts” the closest edge of the tabletop so it appears flat. 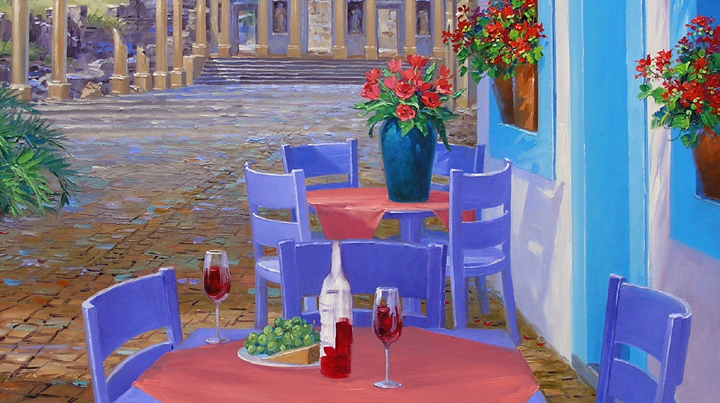 The wine in the glasses is a transparent wash of Alizarin Crimson + Liquin. 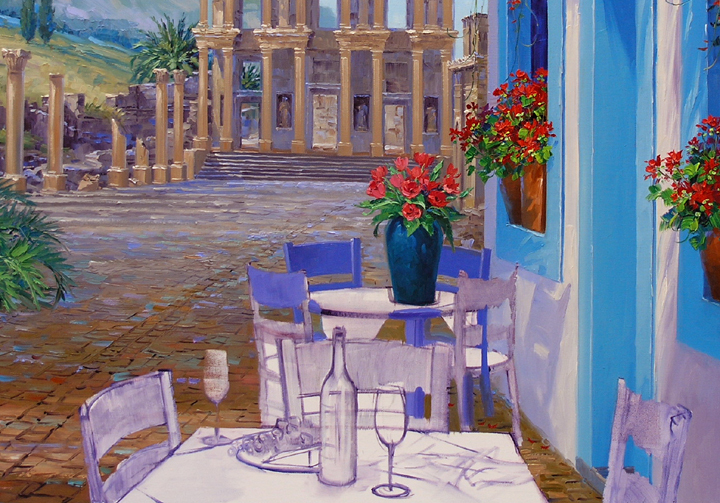 This is the part of the painting I approach with total fear and trepidation. Making the wine glasses the same. 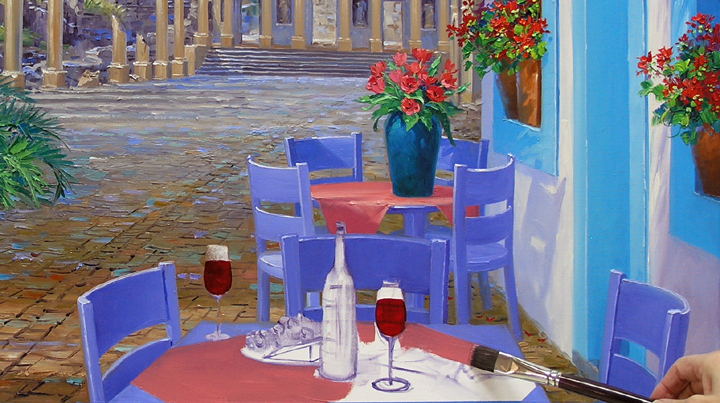 It’s easy to paint one glass of wine, it’s getting the second one to match that’s the toughy! WHEW! I can wipe the sweat from my brow, the glasses are done. Now it’s on to the grapes. Taking a little of the green paint that was saved, I add a bit of Hansa Lemon Yellow + White and we’re in business. The darkest greens are blocked in first, followed by the highlights. The fruit and cheese plate is ready to eat, let’s get to the Wine. The bottle is first washed in with Alizarin Crimson + Liquin in the lower part. 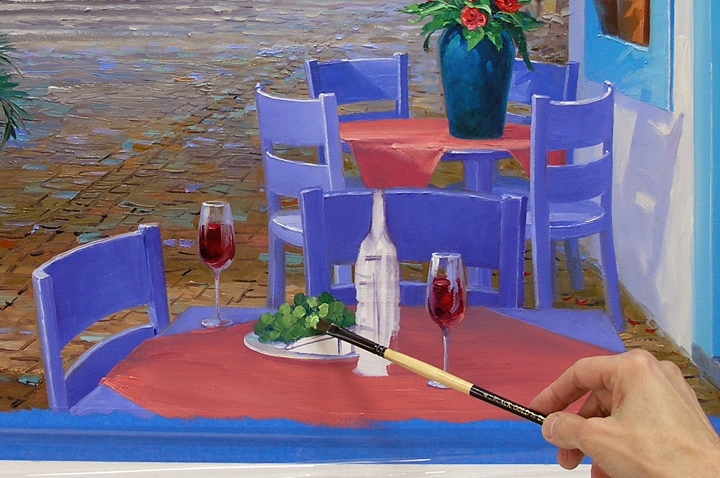 The rest of the wine bottle is painted with a warm green mixed from Ultramarine Blue + Cadmium Yellow Medium. I work with thin washes to order to achieve the feel of the thick, green glass. Now for the icing on the cake, the sidewalk cafe. The tables and chairs are a periwinkle blue. 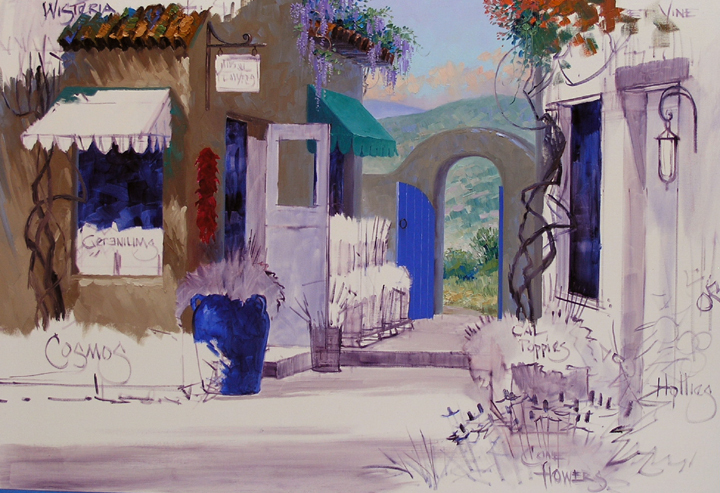 To make it I use a mix of Ultramarine Blue + Dioxazine Purple. 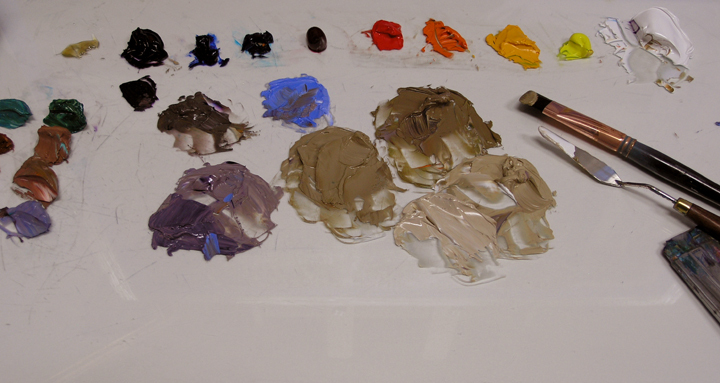 MUD (Ultramarine Blue + Alizarin Crimson) is added for the darker shade, White for the lighter ones. 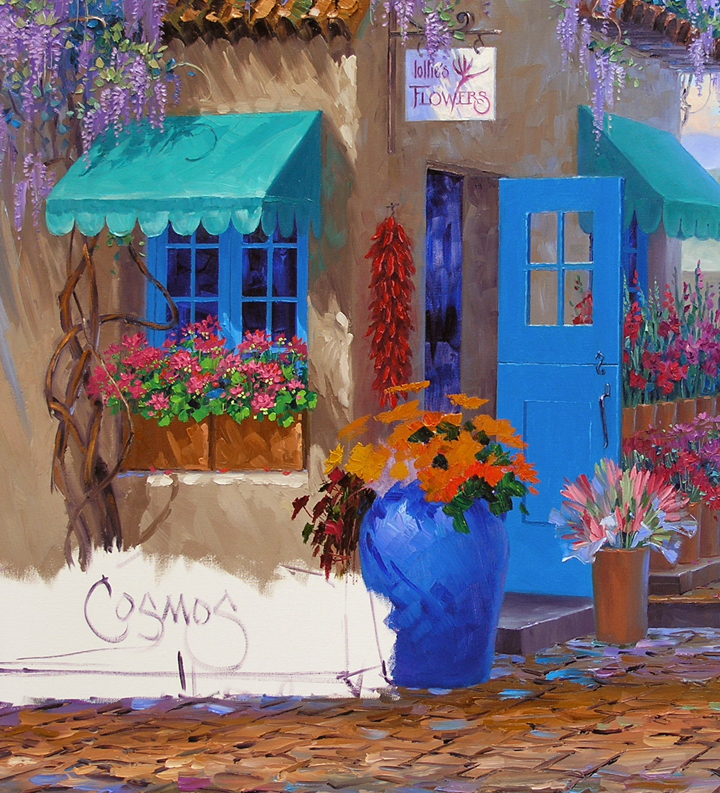 This combination makes a variety of purples and blues depending on how much of each is used. For this particular piece I make the basic mixture more blue. 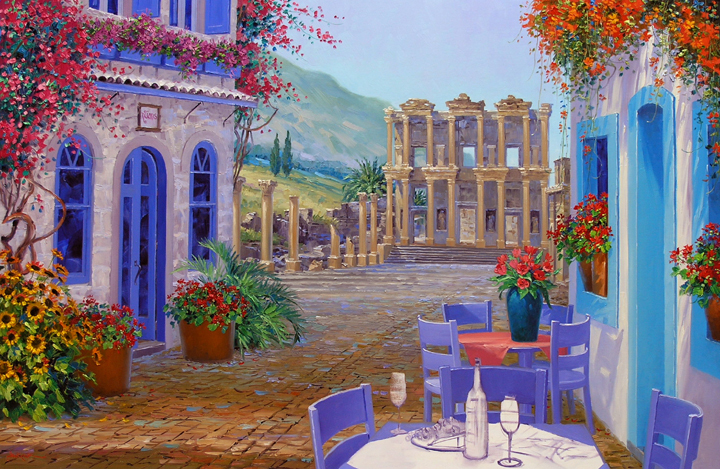 The background chairs are painted with the bluest of the mixtures. Even here the Cool Colors Recede, Warm Colors Come Forward Rule applies. 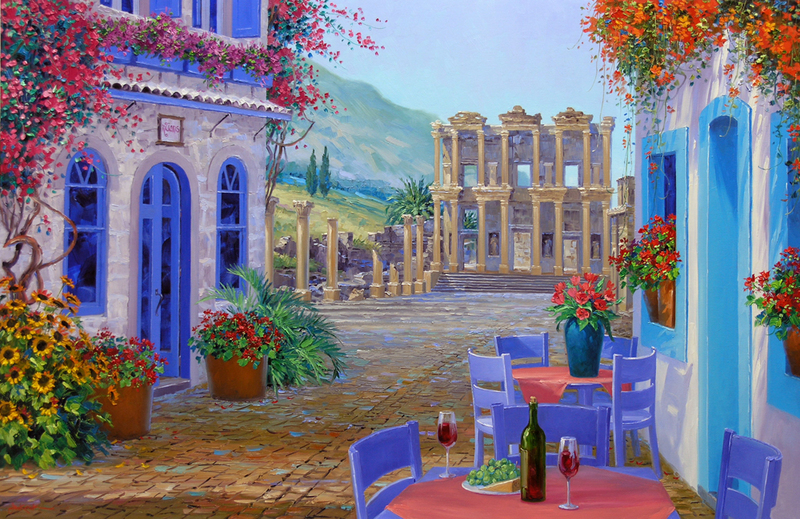 The variation between the far chairs and the foreground ones is very slight, but it still works to give depth. The saved floor colors are used to work in and around the chairs. By saving the paint I don’t have to worry about trying to mix an exact match. The peach tablecloth provides a Zap of color. 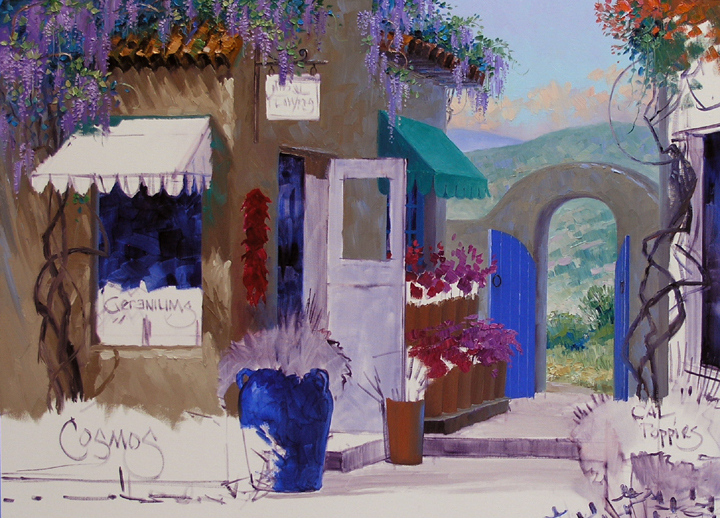 This is a combination of Cadmium Red Light + White. A little Alizarin Crimson is added for the shadows. 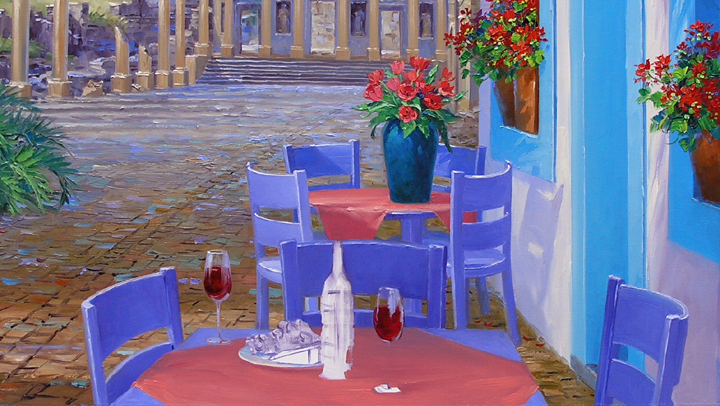 The foreground chairs are darker and have a touch more of the Dioxazine Purple in the mix. I’m so glad I spent the time at the beginning making an accurate drawing of the tables and chairs on the canvas. It certainly makes this stage much easier. I can just hang on to the brush and let it fly.